Have you heard that content marketing is a foolproof approach to increasing revenue? Content marketing is so simple that anyone can do it, right? Just slap some words on a blog post and you’ll be the most successful marketer on the block. 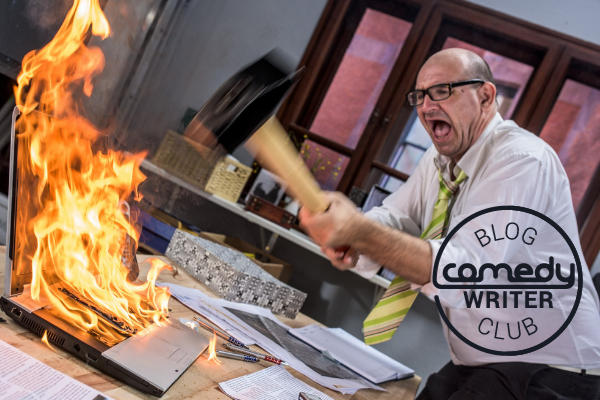 Don’t underestimate yourself – you have what it takes to ruin your organization’s content marketing efforts in just 10 easy steps. We like to call this the “sit quietly in the dark corner and hope nobody notices you” approach to reaching qualified customers. A whopping 77 percent of internet users read blogs, and small businesses with blogs get 126 percent more lead growth than do small businesses that don’t bother with blogging. All that growth is exhausting! Half of all business-to-consumer (B2C) marketers use storytelling, according to Content Marketing Institute’s (CMI) B2C Content Marketing 2019—Benchmarks, Budgets, and Trends. Storytelling helps prospective customers connect with your organization on a personal level, which helps build brand loyalty. Content Marketer Tricks Potential Customers into Clicking on a Link – You Won’t Believe What Happens Next! A scientific study shows that the use of clickbait in headlines has a negative effect on credibility, and everyone knows credibility is way overrated when it comes to making sales. Facebook and other internet entities are catching on to the immense power of clickbait, too, and they have even written algorithms to spot and suppress clickbait before you can disappoint even more potential customers with fake headlines. Nobody wants to read web pages that make sense! They didn’t go to a Texas-based website on food history to learn that tacos probably originated in 18th century silver mines in Mexico, for example. No! They want to read an entire page about tacos in San Antonio, San Antonio tacos, where to find tacos in San Antonio, best San Antonio tacos and best tacos in San Antonio. What’s better than focusing on keywords instead of content? Stuffing those keywords like you’re trying to jam three pounds of sausage into a one-pound casing, of course! People love to waste time reading random words crammed into nonsensical statements, so pound as many keywords into every sentence possible – put your foot into it if you have to! Let’s face it – coming up with a half dozen words or phrases that describe your organization is a whole lot of work. Using keywords properly might pop your organization’s website out of its comfortable position on the 49th page of a Google search and bring it towards the first page, where qualified prospects might actually find you. Doing well on search engine results also helps establish you as a leader in your industry and, frankly, who wants that kind of pressure? Whatever you do, do NOT post to social media. Nearly one-third of the world uses social media, which means you might gain unwanted customer loyalty and sales by posting to Facebook, Instagram, Twitter or other social media channels. In a 2018 survey by HubSpot, 90 percent of all marketers said social media marketing increased their business exposure. All this business exposure increases sales, and all that success may cause wear and tear on your sales department. About 55 percent of visitors to your website will spend less than 15 seconds there, according to HubSpot. You can get rid of the other 45 percent in under a minute with boring content. You would hate to educate your customer base with whitepapers, how-to guides, podcasts, case studies or webinars – if you offer them informative content once, they might grow to expect it. The same goes for entertaining your client base with memes, short rants, photographic images, animations and gifs. If you stick with blogs, your customers will know that you avoid creativity and innovation as much as they do. Don’t bother developing a content marketing strategy that outlines your organization’s goals, intended audience, keywords, content objectives and expected return on your marketing investment. A content marketing strategy helps introduce your product or service, establish your brand, increase brand awareness, expand into new markets and, worst of all, attracts new clients. If your organization is like most and you have more money than you know what to do with, you too can benefit from terrible content marketing. Your sales force will thank you.